FB - I’ve been struggling recently with the inescapable –and timeless- question of the role of art in times of insecurity, volatile economies, climate changes and political turmoil. When the future no longer seems predictable I guess we tend to reach for the past and its stable narratives as possible answers of how we ended-up here or how to proceed. Your work delves into vernacular techniques that are later combined with found tribal objects and industrial materials -an ancient kuba textile mended together with cheap and colorful Chinese threads. How do you see the question of permanence and how you relate with the provenance of the materials and techniques you use to shape your work? 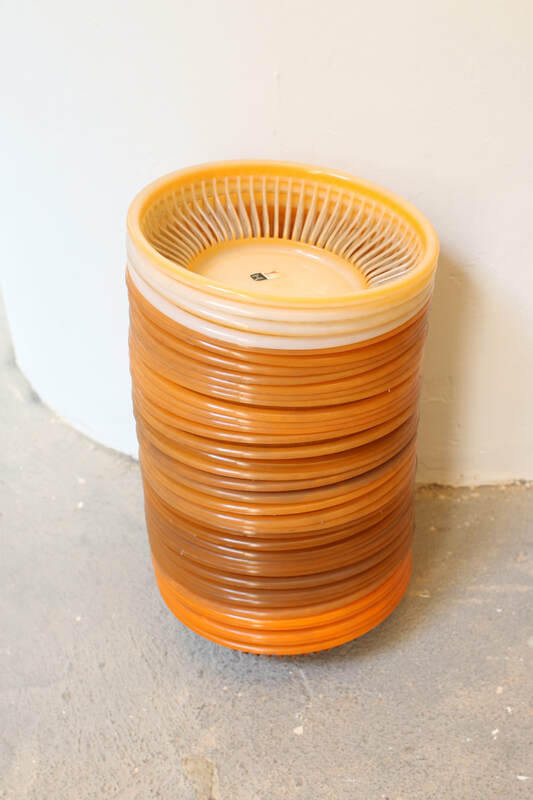 DC- My works often evolve from or utilise found objects, in particular those that connect to what I term ‘speculative histories’, and objects that have long-running narratives that span many, even every culture. Basketry is one example of this where, due to the perishable nature of the natural materials employed, few ancient basketry artefacts exist. What we know is mostly derived through fossilisation. There is a theory that in pre-history, basket makers packed their woven vessels with clay in order to contain liquids, and that through accidental fire, the basket perished and the first fired clay vessel remained. This theory interests me, as one would assume that at this point basketry would become outmoded, yet it is still practiced widely today. Although these historical narratives inform the work, it is a mistake to assume that my works are concerned only with the past; I consider my practice to be dealing with a very current situation, and in turn the future. 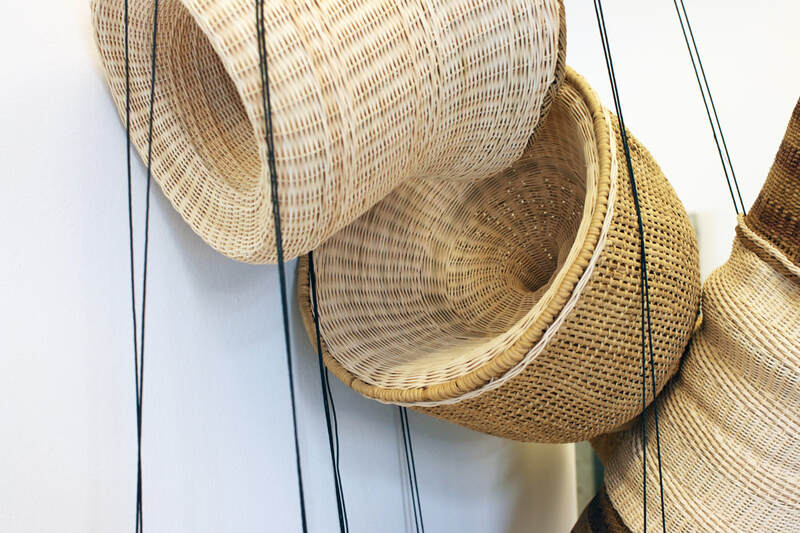 My works which involve basketry are often interpreted through ancient histories, yet with the new works for Pivo, the viewer will be very aware of the freshness of my new materials when contrasted/intertwined with that of the found indigenous vessels. I am very impatient to see my works in ten years time, as I am very conscious of how the rattan I use will age, its colour deepening over time. My intervention with the Kuba textiles you mention above was to mend the holes and tears in the textiles surface that have amounted over time through their use as ceremonial dress. The value of these cloths is largely dependent on their condition, so I was interested in considering how my repairs would shift their value, as my intervention could be considered both an act of compassion, in some sense rescuing them from ruin, but on the flip side it could be considered invasive, even destructive. However these works are considered, my interaction with them has ensured that they remain intact for years to come, even if they may no longer function within the culture from where they came. FB- you always hide small objects inside of the basket-works. I really like the idea of an artwork having a secret, something that can only be accessed if the sculpture is tear apart. Sometimes the titles are hints for what’s inside. Can you tell me a little bit about these hidden objects and how do you select it? DC- the objects that I have hidden inside previous woven works are always found items, either tools or ornaments that are handcrafted from base materials, metals, minerals etc. These objects perform several functions within the work. I am interested in how an object’s value shifts when out of sight. For example, one such object, a nineteenth century set of hand carved ebony piano keys, to all intents and purposes, returns to the raw material when the only evidence of its presence is that material listing in the work’s caption. 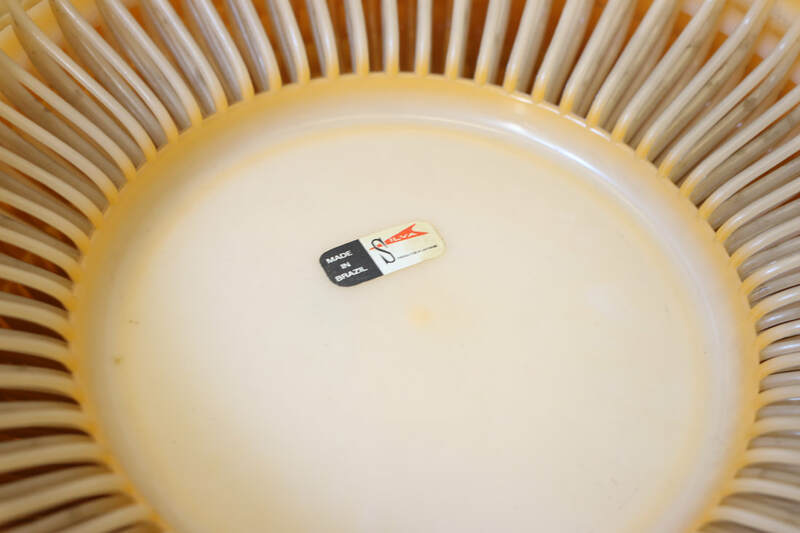 I like however that in, say, a hundred years time when the basket has perished, the object inside retain its original value, though presumably by then, the value of ebony, and the value of piano keys, will have shifted either up or down. But hiding the objects, it also raises the question of the value attributed to artistry and craftsmanship. Each time I make a new work in this series, I try to find an object made from a material I haven’t used previously. I enjoy this challenge, because as the series progresses it becomes ever more difficult. The objects are often antique, as handicrafts are largely outmoded and replaced by mass produced items. I find each time I travel that I am introduced to new materials, for example in Sicily I found coral, and here in Brazil alot of items made from nuts, stones and agate. FB- For this exhibition you are trying something new. 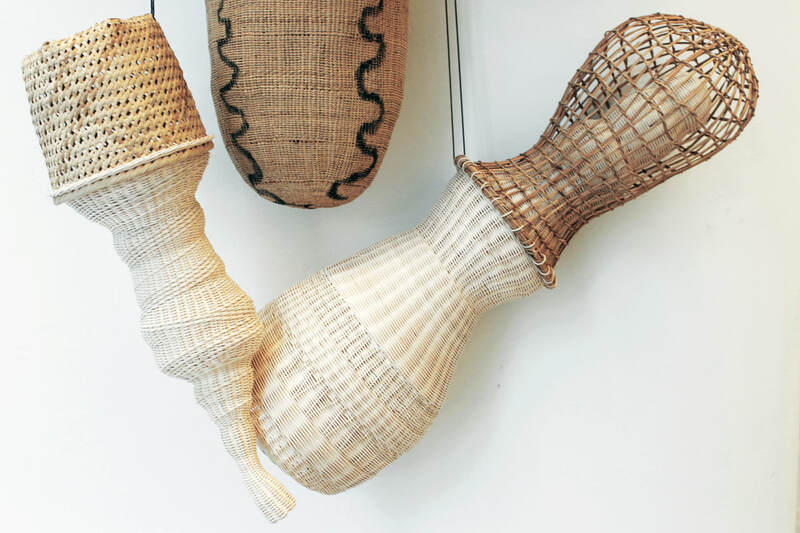 Combining found indigenous artifacts (pots and baskets) with your particular methods of weaving. I guess it’s different from the kuba-textile works because instead of fixing the holes in the old fabric using new materials you are creating new structures that depart from the artifacts, thus annulling the possibility of practical use of those objects and their relationship to their origin or any kind of symbolic value they might have. 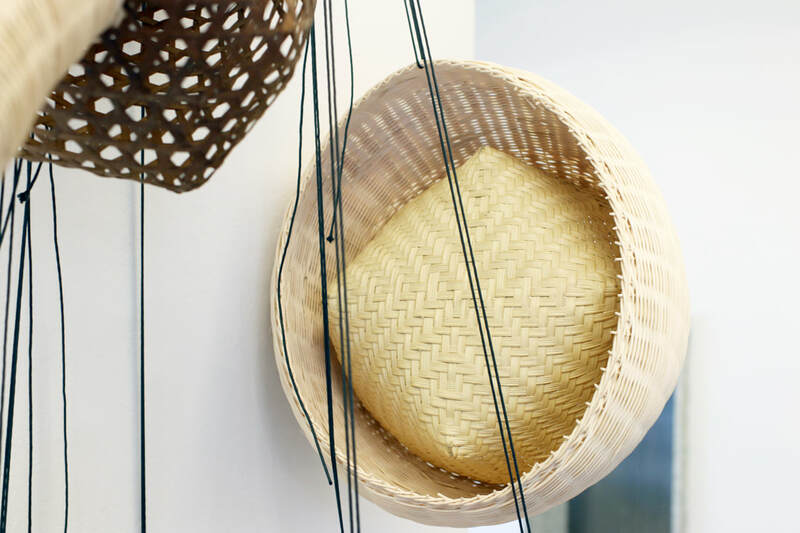 In these works, the indigenous basket is in the same hierarchy of the rattan threads. You are constantly shifting the notions of material and symbolic values in your practice, the copper works are also an example. Can you tell me how you see the relationship of attributed value and the raw matter throughout your practice? 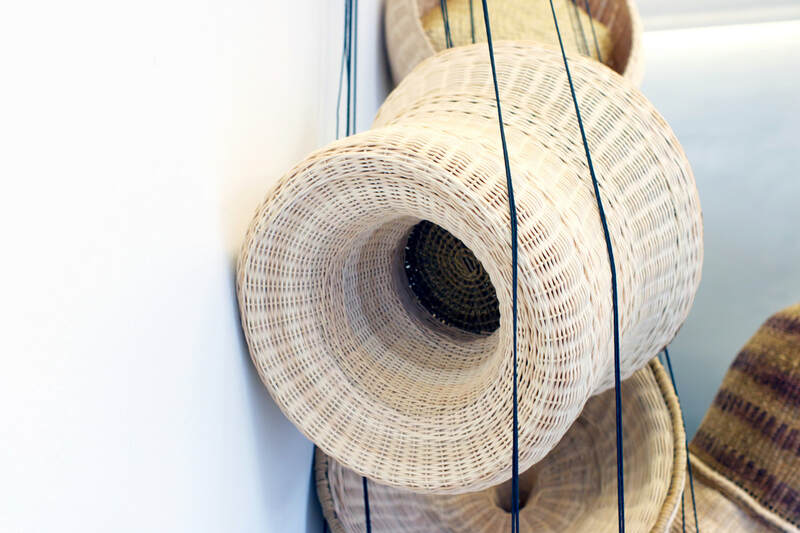 DC- The use of indigenous baskets in these new works, partly came out of an interest in what I perceive as a very unstable, fluctuating set of values that are attributed to these objects. Already removed from the context where they were made, their value here in a big city, specifically São Paulo is mostly for use as decorative items for the home, particularly for the educated classes. Their material value is also increasing rapidly as indigenous communities are depleting, and there is now a scarcity of authentic indigenous items. Most of what you will find in indigenous stores in São Paulo today are not what you could term genuine artefacts, but items made solely for this particular market. 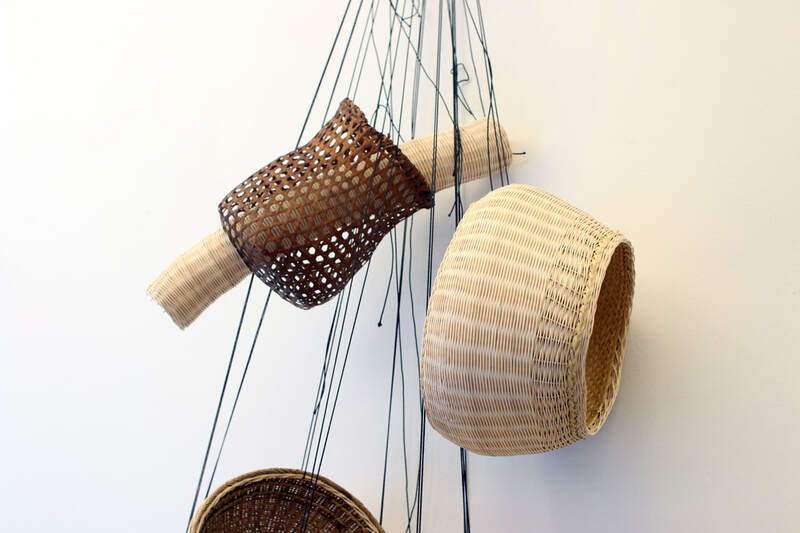 My intervention with these baskets, expanding and altering their forms using materials and some techniques which are alien to their origin does indeed disable their ability to function as practical vessels, yet it is a condition that in some respects is already inherent in these vessels through their displacement. Last time I was in São Paulo, I spent a lot of time studying and admiring the indigenous baskets, yet felt uncomfortable trying to imitate the techniques I discovered, and although my intervention here could seem intrusive, I feel the contrast with my own weaving that I instigate here, somehow allows the found objects to retain their identity, perhaps even heightens the viewer’s awareness of the specific forms and materials utilised to create the indigenous vessels. FB- Vernacular techniques of architecture and artifacts are not so easy to find in Brazil anymore, what wasn’t entirely replaced by industrial manufacture and importation is nowadays closer to ethnical merchandise with decoration purposes. Lina Bo Bardi’s seminal show A Mão do Povo Brasileiro, reedited recently at MASP, dealt with this questions by putting together a large inventory of what use to be ‘The Hand of the Brazilian People’ in 1969. The curators chose not to update the collection and showed only pieces from that period. The exhibition from 1969 became itself a museum piece and, arguably,contemporary art is looking more and more to the locally sourced and to it’s own ecological footprint (the latest editions of the Venice and São Paulo Biennials are good examples) instead of reinforcing the lavish and globetrotting art world of the early 2000s. You mentioned to me once that people say often your work looks Brazilian and it is the second time you spend a long period in the country. How has being in Brazil affected your work? Do you agree with this image of your work? Or maybe is a stereotyped idea of handmade work belonging to underdeveloped environs? DC- Indeed last time I was in São Paulo, many people thought my work looked ‘Brazilian’, and this was really what has instigated the works I’m making here now. Being a self taught weaver I am very aware of the specific origins of the weaves I use and the materials I employ, and am therefore able to make a strong distinction between the weaving I do, which is actually a hodge podge of weaves from across the globe, that I use to form vessels which have no real point of reference in terms of cultural identity, and the very specific weaves and materials used here in Brazil. 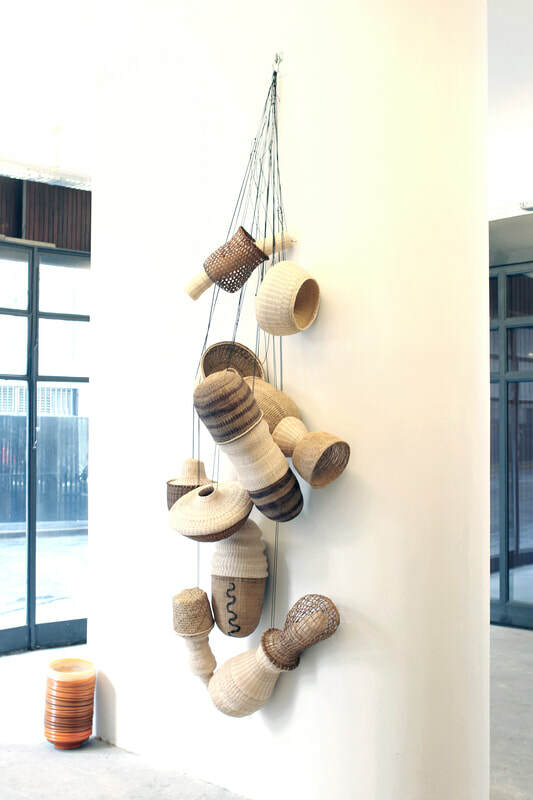 I think the resultant works are interesting as they in some ways dispel of this idea, through the direct contrast I set up, but in some ways they could be considered to look even more Brazilian, as they employ found Brazilian objects. But it is an interesting idea. You see the label ‘Made in Brazil’ on many products here, mostly food; as a foreigner in São Paulo making these works, could I label them as ‘Made in Brazil’? and what would it mean to do so. I still don’t really have an answer. 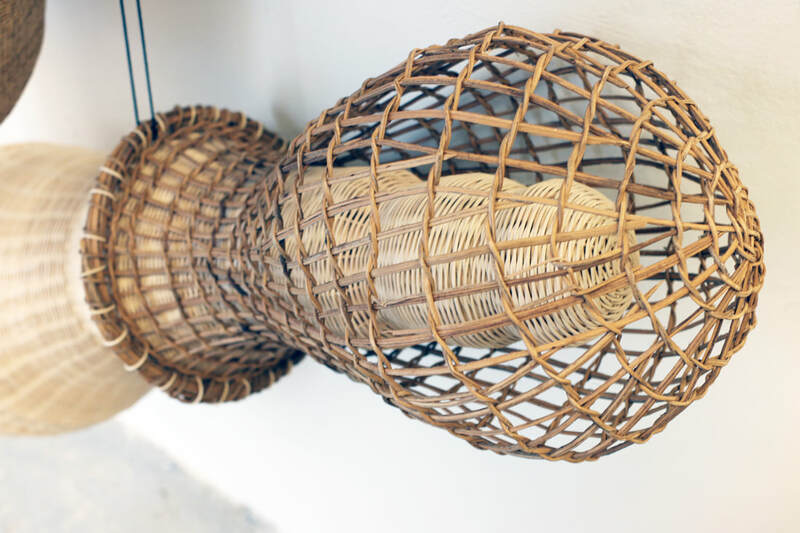 Handcrafted objects such as baskets are often collective endeavours when made in indigenous communities; the sourcing of materials, their preparation and then the crafting of the objects themselves may involve many hands. I am aware that I am making my works in the city, within a society that is more geared towards the recognition of individuals. Of course this is evident across social media etc, but it is interesting to think that by utilizing these objects in my artwork, they in some way become authored, and their value is shifted under my name. Perhaps my act of weaving also receives a higher recognition, precisely because I am doing it in a context dominated by quick mass production and flat screens. But I hope that through the recognition of my own manual labour, people might consider the other hands involved, maybe even see my works as a collective endeavour. FB- To end this conversation, can you tell me a little bit about the process and installation of this particular exhibition. Is the context and the architecture of the space playing a significant role in the conception of the show or you are manly focused in producing the artworks? DC- For this exhibition I have chosen a fairly informal mode of presentation, the objects that I have created are in themselves quite informal. 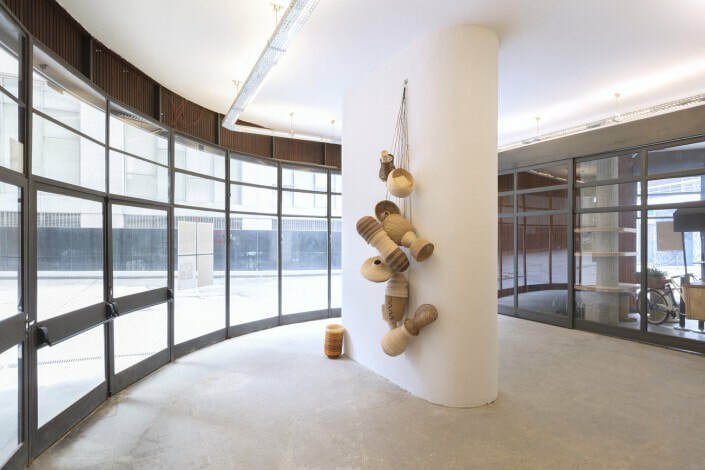 This non-hierarchical method of display also references the environment of the indigenous stores here in São Paulo, often a jumble of different forms and textures. Kind of a beautiful mess, a little like here in Centro.